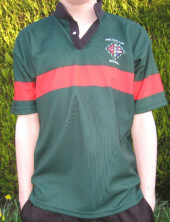 Bottle green rugby shirt with red stripe on chest and sleeves, black grandad style collar and Wellington School logo printed on left chest. Upgraded to standard weight Fusion fabric to give water repellency, and a more robust garment with a softer feel. Machine washable and fast dry for easy care.